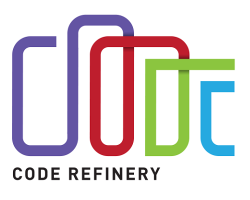 CodeRefinery is visiting Sweden again! A 3-day workshop on best practices for sustainable scientific software development will be held in Linköping on November 7-9. The main focus is on professional tools for efficiently developing and maintaining research software. Since code is often developed in a collaborative setting, tools and workflows for collaborative code development will be introduced, but most of the content is also relevant to a single developer. The number of participants is limited to 26, so make sure to register early!